Across the country, event planners and hosts rely on inflatable rental companies to add life to the party. Renting out commercial-grade inflatables can be a lucrative business venture, especially for those who want to own their own small business. Most rental operations start with a small collection of bounce houses – the classic inflatable product – and these products are incredibly popular with customers. As the business grows, many business owners look to add to their inventory, giving them the opportunity to reach more customers and to provide inflatables for more events throughout the year. Inflatable slides are fun and colorful additions to the rental lineup. Here, we’ll check out a few of the most popular inflatable slide models and take a detailed look at the features that make these stand out from the competition. 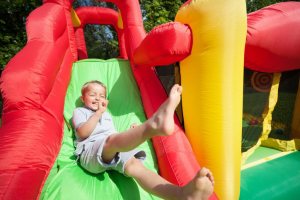 Before we introduce some of the most popular models of inflatable slides, it is useful to understand the major features of these products. There are two primary types: wet/dry slides and dry-only slides. Construction of the two types is the same, with heavy-gauge vinyl material and stitching used throughout to provide lasting durability. Each type features a main body and the slide itself, configured in single or multiple slide lanes. A climbing ramp or ladder is found alongside the slide lanes, or can be mounted to the side or the back of the inflatable unit. The real difference between the two slide types is in the added feature of the wet/dry slides, which come with a splash pool at the base of the slide instead of an inflatable bumper. Wet/dry slides can be used with water when the weather is warm, or the splash pool can be removed for dry operation in cooler conditions. Dry-only slides can be used year-round, and are a great way to add fun to any party or event where children are expected to be in attendance.